I still remember my very first time seeing Disney’s Peter Pan; I was at my grandmother’s house, and I’d just been given the VHS tape as a gift. My first memory of Peter Pan is him in the shadows atop the Darling’s home. That scene is still among my favorites from the film, and Peter Pan ranks in my Top 5 Disney favorites. 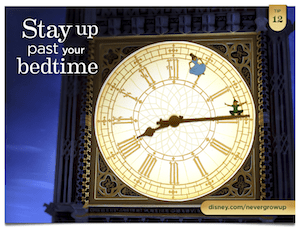 Because Peter Pan has always been a favorite Disney movie of mine, I made sure it was the first movie I ever watched with Zoe when she was a newborn. I knew it wouldn’t have any significance to her at such an early age, but I hoped somehow she would grow up sharing my love for Peter Pan. 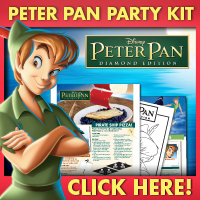 On February 5th, 2013, Peter Pan came out on Blu-ray for the very first time. Since this was a movie that strongly defined my own childhood, I am thrilled to be getting to see it in this exciting format! One of my favorite things to do as a child was “pretend”. I love props to help enhance play time, and so does Zoe! We were both so excited to see what was in store for the 60th anniversary of Peter Pan. 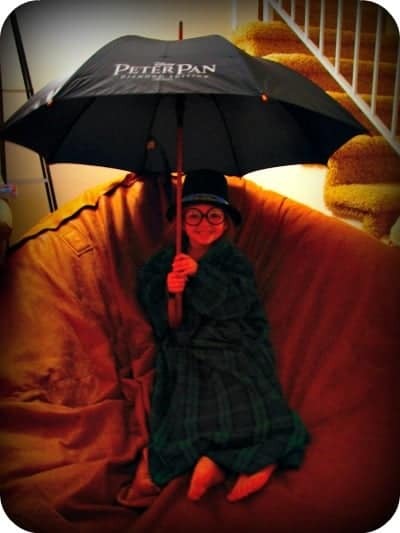 A top hat, glasses, night shirt, and classic umbrella helped Zoe transform into a character straight out of Peter Pan! She giggles every time she wears the top hat and glasses. Even I’ve enjoyed getting into the spirit of things; the pajamas are warm and comfortable and perfect for me to sleep in. The umbrella is more than just a play time prop; we’ve been in need of a sturdy one for windy rainy days, and it will do the trick. In the meantime, though, Zoe is having fun dressing up to watch Peter Pan with mommy. I love the nightshirt and umbrella!